Aptera Strings perform at A New Leaf in Chicago. Photo by Edward Hopman. Facebook. 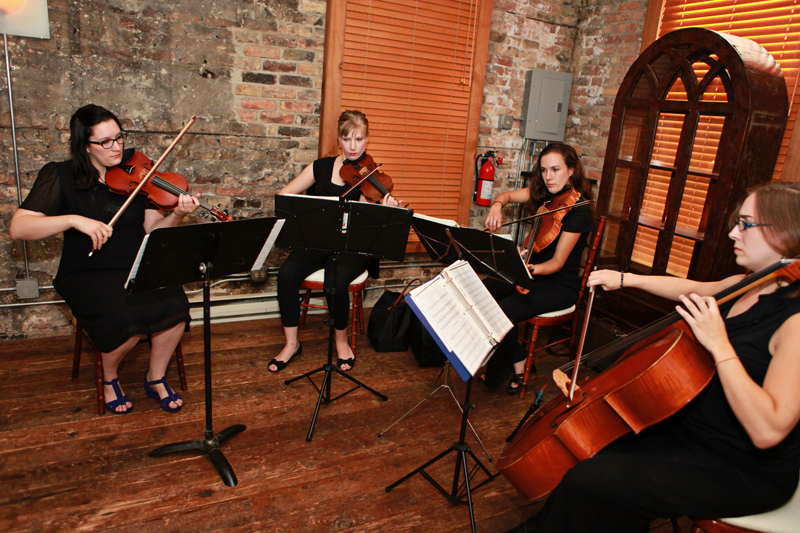 Aptera Strings are a collective of active professional musicians in Chicago. We specialize in being flexible performers with a large repertoire and the ability to perform any style of music in almost any location. We can provide groups as small as a duo and as large as a chamber orchestra. We have a large repertoire of classical music and also arrange contemporary popular music for our clients. A sampling of our string quartets and videos of our pop music trios can be heard on our Listen page. In addition to violin, viola and cello, we also offer guitar, bass, harp, mbira and piano music in any combination. Don’t hesitate to contact us about your wedding, party or other special event. For a list of our current repertoire, visit our Repertoire page.